In this house, for quite a long time now, Anthony Horowitz has lived in a box labelled ‘A Great Author But Not For Me.’ I might have bought his books as gifts for younger relations, I might have considered his recent sequels if I ever finished reading Conan-Doyle’s original Sherlock Holmes stories, but that was about it. Until I saw this book and I thought it could have been written for me! It’s not going to be the easiest book to write about without giving too much away, but I have to try. 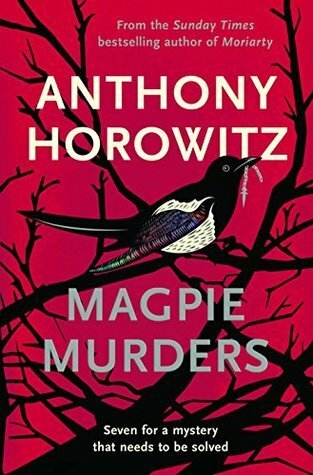 ‘Magpie Murders’ is a wonderful pastiche of a golden age murder mystery, wrapped up in a contemporary mystery. Each one was a wonderfully engaging story and an intriguing puzzle; and the cleverness and originality of the connection between the two made this book a joy to read. The book begins in the present day. Susan Ryeland works as editor for Cloverleaf Books, a small, independent publisher, that has stayed in business because it has one hugely successful author. Alan Conway is the author of the hugely successful Golden-Age-style series featuring German detective Atticus Pünd. Susan has never warmed to the author but she has always loved his books, she knows that a proposed BBC television adaptation will be very good for business, and so she is delighted when a new manuscript arrives and she can get to work. The title of Alan Conway’s new work is ‘Magpie Murders’. As soon as the situation in the present day has been established, the book turns into the manuscript that Susan has begun to read. She reads a story set in the 1950s, in the little English village of Saxby-on-Avon. One of the villagers, Mary Blakiston, has been found dead at the bottom of the stairs in Pye Hall, where she worked as a cleaner. It could easily have been an accident, she might have tripped over the cable of the vacuum cleaner at the top of those stairs, but somebody who wanted justice to be seen to be done called in Atticus Pünd has in to investigate. This is the beginning of a wonderfully engaging mystery. There are a number of suspects, and they all seem to have something to hide or something that don’t want to talk about. There are events in the past to be uncovered and understood. There are a great many clues, many of which may well be read herrings. And there was an intriguing puzzle to be solved. There were lovely echoes of real Golden Age mysteries – especially those written by Agatha Christie – and that made this original story feel wonderfully familiar. I knew it was a manuscript, I could see some things that needed tidying up, and that worked very well, reminding me that I was reading a manuscript but not detracting from the story I was reading. The manuscript ends at the point in the story when Atticus Pünd has announced that he has the solution to the mystery but before he has explained or there has been a grand denouement. The final chapters are missing. Back in the present day, Susan in perplexed. When she learns that Alan Conway has died at his country home she realises that the circumstances of his death, believed to be suicide, might just be murder. She knows that she has to find those missing chapters; she wants to know how the story end, and she know that her professional future might depend on it. As she searches Susan finds striking parallels between the fictional world of Saxby-on-Avon and world of its creator, Alan Conway; and she finds a great deal to help her understand the man himself rather better, and like him even less. I loved this story too. It gave me some lovely insights into the world of publishing; it helped me to place one or two points in the manuscript that had felt very familiar, and it was just as engaging and compelling as the story in that manuscript. I know I’ve mentioned that links and the parallels between the two stories already, but I have to mention them again because they were so well thought out and so lovely to spot. I spotted some of the clues and some of the red herrings; I suspect that I fell into one or two traps along that way; but I don’t mind at all because I had such a wonderful time watching the story unfold, and thinking how clever and how well executed everything was as the truth was gradually revealed. There are so many interesting things woven into this book. The author played fair – the clues were there – and while the story was clever and beautifully engineered it wasn’t that just for the sake of it. Everything was there for a reason, and I always had the sense that the author loved what he was doing and that her had read and loved many of the same books that I had. If you pushed me I could find a few small niggles – I didn’t find Susan’s personal life 100% convincing; there was an aspect of the denouement of one of the stories that was a little overdone – but in the end that didn’t matter. Both stories were resolved beautifully, and as a whole the book worked wonderfully well. I’m a little sorry that I’m not able to read more about Atticus Pünd’s past cases. But two excellent, intertwined mysteries for the price of one really was an excellent deal! Same as me Jane. I keep half hoping that if I Google earlier Pund adventures, the books might really show up and I can read them! We can dream, can’t we?! And I must read your review that I remember sailing by while I was in the middle of the book. Well, you’ve certainly given me something to think about. I read several of Horowitz’s children’s books to my son when he was younger, and while they were exciting and well written, it wouldn’t have occurred to me to consider reading Horowitz’s adult fiction myself. However, I do like the sound of this Golden Age style mystery. I’m quite intrigued – I might have to check this out! I only know his other work by reputation, but I was so taken with this that I have to say that if you like the sound of it you really must find a copy. Yes I did – purely by chance – and loved it. I’m not so sure about the subject matter this week but I’ll give it the benefit of the doubt but I’m really looking forward to the programme about Virago on the 31st. This book is definitely tilted towards Agatha, but I would recommend it to anyone who enjoys that Golden Age. This sounds very accomplished and readable – not always a pair that goes together. What fun! This is a wonderful book, isn’t it? I loved it too and I also wished the other Atticus Pund novels really existed. The idea of the Sherlock Holmes sequels hadn’t appealed to me, but after enjoying this book so much, I’m thinking about trying them. It is – and I must thank you because I think it was when you mentioned it that this book really caught my eye. I’ve heard some good things about this already, Jane, but now you have me convinced – sounds marvellous! I was very impressed, and I think you would enjoy this too. None of his previous books really appealed to me so I can’t comment on his writing generally, but I was very taken with this. Jane…I have no idea how you do this, but you are simply brilliant at introducing me to such authors! !I have to get hold of Horowitz, though in general I have never much liked his books! I meant I never liked the plots of his books and have thus far avoided him!! Me neither, but this looked different and interesting – I was impressed. I love the idea of this story; what a fun way to tell a mystery. I’ve added this one to my list! 🙂 Thanks! Yes it is. I’ve read a lot of Golden Age mysteries – and more recent books in the style – and this was a lovely fix of the familiar with something a little different. Another vote here for more about Atticus Pund. Clever plot and twists and turns. I have not read any of his other books, but do enjoy his writing on TV though. I bought this after reading your review. Am looking forward to readin it a lot. I’m so glad you put this author on my radar. We have many of his books for young readers in our library. I didn’t know he was British, and I didn’t know he wrote for adults also. Thanks!